HOW CAN LEAN BODY HELP ME? Lean Body will help you get leaner & healthier! Lean Body hi-protein meal replacement shakes are the quick, convenient nutrition solution for anyone who has little time to prepare meals. 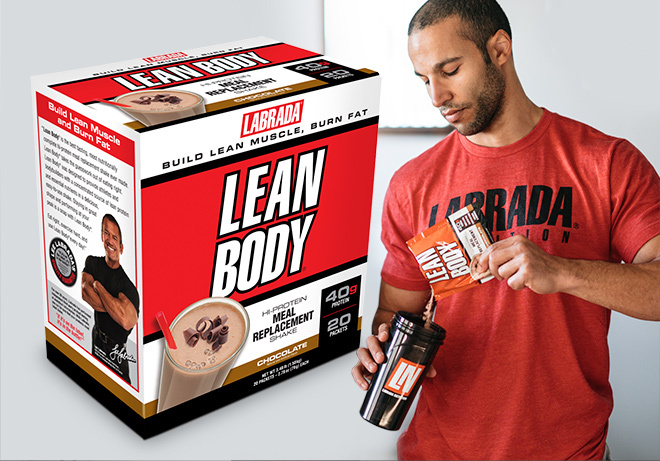 Forget other supplement pills and powders — you get it all in Lean Body: concentrated muscle-building, fat burning nutrition in one delicious, easy-to-make shake. In an eight-week, doctor-supervised study, participants using Lean Body in conjunction with their exercise regimen gained lean muscle mass body fat. 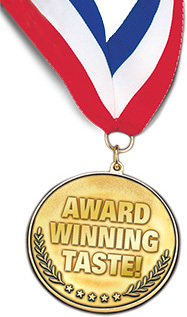 LEAN BODY is a 5-time winner of the American Culinary Institute’s Gold Medal Taste Award. LEAN BODY was taste-tested at Texas A&M University by 611 college-aged students who took part in a blind taste test comparing the LEAN BODY against another top brand of meal replacements. 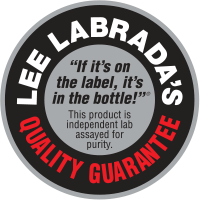 Of those who showed a clear preference for either product, 80% preferred LEAN BODYover the other brand. LeanPro® (Cross Flow Micro Ultrafiltered Whey Protein Concentrate, Cross Flow Micro Ultrafiltered Whey Protein Isolate, Milk Protein Isolate, Glutamine Peptides), EFA Plex™ (Sunflower Oil, Creamer [High Oleic Sunflower Oil, Corn Syrup Solids, Sodium Caseinate, Mono- And Diglycerides, Dipotassium Phosphate, Tricalcium Phosphate, Soy Lecithin, Tocopherols], MCT Oil, Flaxseed Oil, Borage Oil), Cocoa (Processed With Alkali), Fiber Plex™ (Polydextrose, Fibersol 2 Fiber, Cellulose Gum, Oat Flour, Rice Bran), Natural And Artificial Flavors, Vitamin & Mineral Blend (Di-Calcium Phosphate, Magnesium Oxide, Ascorbic Acid, Vitamin E Acetate, Niacinamide, Electrolytic Iron, Zinc Oxide, D-Calcium Pantothenate, Pyridoxine Hydrochloride, Copper Gluconate, Riboflavin, Vitamin A Acetate, Thiamine Mononitrate, Folic Acid, Potassium Iodide, Cyanocobalamin), Fructose, Salt, Sucralose, Acesulfame Potassium. For weight management, replace 1 daily meal with a packet. Use 10 oz. of water or your favorite beverage. 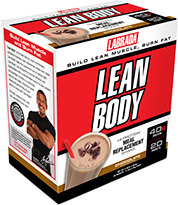 Add 1 packet (79g) of Lean Body® and mix in a blender or shaker.